The Quintessential Cozy Maine Cottage – steps from the beach in the most beautiful location in a charming seaside neighborhood on a private road It is a two floor, two bedroom, two bath cottage. Lovely, well kept, updated interiors on private road with water views. Just minutes from the city of Portland but feels like miles from any city on a private road in a lovely Falmouth Foreside neighborhood. You are a short walk to the famous Town Landing Store and 15 minutes south of Freeport Village shopping. Everything you need for the perfect vacation week. pak-n-play, beach towels/chairs, Fire pit and fishing rod on site. Parking for two cars, but preferably one. Quiet private Maine Cottage near private Beach: A week is not enough time to enjoy the beach, tour the coast, take a windjammer sail up in Camden, shop in Freeport, antique your way through the charming villages along the coast. There is downtown Portland with its Ferry boats to the islands. Visit quaint Kennebunkport, 1/2 hour to the south. Enjoy our wonderful Maine seafood restaurants. The very best adventure is to kayak along the coast. Even beginners can get the hang of it. At the end of the day bring the fire pit and wood to the beach for a sunset cocktail. Charming seaside neighborhood and private beach will help you get away from it all. I was raised in the NYC area and raised my kids in the Villanova area of Pennsylvania. I moved to Falmouth and this cottage in 2001 and fell in love with the neighborhood. I have been rehabbing and updating the house over the years bringing it to its current lovely condition after purchasing it in 2007. I love Maine and the charming, quaint and upscale Foreside area along the water. This house is located on a quiet private street and yet only minutes to downtown Portland. Its the best of all worlds. The beach is private, the evenings quiet and the neighbors are delightful. While visiting my now growing family around the country I enjoy sharing my home with others. It is steps from the beach )less than 30 yards and a kayak rack is available. I am not right on the beach but have limited water views from my windows as shown in my photos. Because this is my lovely home it is decorated with my own belongings and is furnished with items I treasure and my own paintings. I share these things with those who rent it and it has been my experience that my renters appreciate and care for it in a special way. I have recently (2015/16) updated the entire house. I have added new furniture, windows, bathroom, new washer dryer, a new roof and newly upholstered chairs, etc. I use quality sheets and towels and I have added special touches. It is not your average beach rental. There are two bathrooms. First floor bathroom has a tub Second Floor has bathroom with only a shower, not a tub. Upstairs living room creates a suite of rooms on the second level, while downstairs master and kitchen creates another suite. Great for one or two couples. Upstairs bedrooms has an air conditioning unit. I am not directly on the beach - although i am only about 50 feet away and you can easily walk back and forth when planning a lobster bake or beach cook out. There is a landline for limited use. Pretty much everything you could possibly need if you like to eat at home. With nice dishes for home use and a basket of dishes and necessities for a lobster bake on the beach. If you bring kayaks space will be available on rack at waterfront. Cottage has everything necessary for the perfect vacation including kayaks,beach ware, towels and beach fire pit, All household items are included, Washer / Dryer. Quiet setting only yards from the private beach with views from some windows... the house faces open private green area and has views of the water as seen in photos. We enjoyed a lovely four-night stay with our two small children. The home is beautifully furnished and decorated, and has everything you need for a comfortable stay. The host was responsive, helpful, and very pleasant to work with. A note for parents with little ones that the stairs cannot really be baby proofed. Also, in chatting with a neighbor we learned that broken glass is often an issue on the beach, so plan to bring water shoes. We were there during a record heat wave, so our only desire would have been more air conditioner units. However, the temperatures at night were comfortable with just fans. The home is in a wonderful neighborhood and is a quick trip into Portland. We would love to come back for another stay! Great location, lovely cottage with water views and access to beach! Perfect rental, well equipped even for a large Thanksgiving Dinner! Home had everything you need. Beautifully decorated and very comfortable. Great location in the Foreside. Loved staying in this beautiful place. It was comfortable and quiet. The perfect getaway. Spent 3 glorious weeks at Marie's heavenly seaside abode. Beautifully decorated and very well stocked. Mere steps to the beach. Even kayaks are provided! Can't wait to do it again. Thank you so much. So glad you enjoyed your stay. The neighbors loved you too. Convenient to visit our family in Falmouth, as well as, Portland and that coast. PERFECT spot for a quiet retreat! clearly cares for her guests. The house is not "on the water" but has views of Casco Bay from both floors. One can walk to the rocky beach in about 30 seconds. 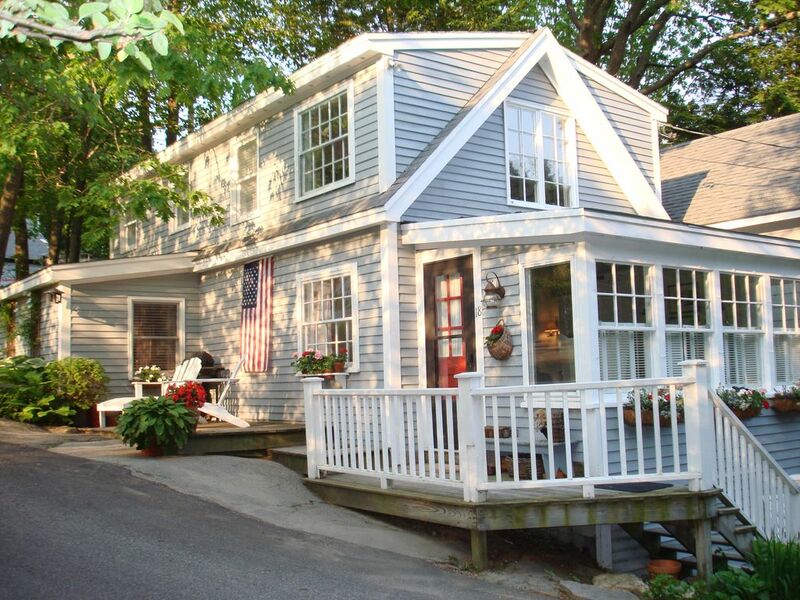 In Maine's beautiful Falmouth Foreside neighborhood, this charming cottage is located in a quiet, upscale area 7 minutes from Portland in a perfect setting steps from a private beach. 4 Kayaks are included for a perfect summer experience on Casco Bay. The cottage is also only 17 minutes south of Freeport. Walk to the famous Town Landing Store for fresh Lobster. A perfect day trip is 1-1/2 hours along the coast to Camden, where you can take an afternoon excursion on a Windjammer. Don''t forget to visit the top of Mt. Battie to enjoy the panoramic views and stop in beautiful Wiscasset on the way home. Only 1/2 hour to the South is Kennebunkport with its charming shops and seaside dining.